We reach the end of the month here at SuperPhillip Central with the first of two reviews. This first one is for a series that needs no introduction, The Legend of Zelda. 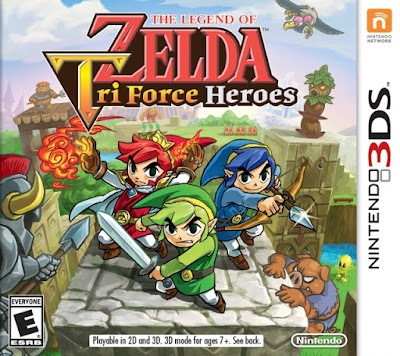 However, this time around the series returns to rare multiplayer form with The Legend of Zelda: Tri Force Heroes. Does it dress for success? Let's find out. One of my favorite video game franchises of all time is The Legend of Zelda. While not every game has rewritten how we play games today or have even been worthy of the Zelda name, the majority generally shine as brightly as the much coveted Triforce. 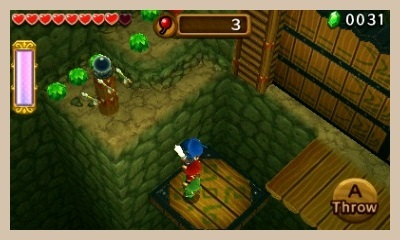 With The Legend of Zelda: Tri Force Heroes, Nintendo takes the Zelda franchise into a more bite-sized adventure with segmented levels, a multiplayer focus, and a wacky premise. While there is fun to be had in this game, Tri Force Heroes has a number of annoyances that keep it from being great. Tri Force Heroes sports a goofy story that replaces an end of the world scenario and a great evil with a princess who has been forced to wear a cursed outfit. It's up to a trio of Links to band together and explore the Drablands in order to break the curse placed on the princess. Everything from the dialogue to the characters are made with maximum goofiness, so this might be a put off to more staunch Legend of Zelda fans. To me, it was just a breath of fresh air and a neat alternate take on the more lighthearted elements of the franchise. you're looking up the wrong dress. Outfits and fashion are an immensely important piece to The Legend of Zelda: Tri Force Heroes. Through earning rupees and materials in levels, you can head to Madam Couture's fashion palace to purchase and make new attire for your Link. Each outfit has its own special benefit to it, such as the Big Bomb Outfit which transforms all bombs used by that player into large bombs with a bigger than usual blast radius. There is also the Cacto Clothes that damage any foe that walks into the wearer of the outfit, the godsend in ice levels, the Cozy Parka, that negates any slipping on ice, and the Goron Garb, which allows Link to avoid damage from fire and lava. There are over thirty unique outfits to collect in all, which can be selected before entering a level. their form by falling into a hole or a pit of lava. 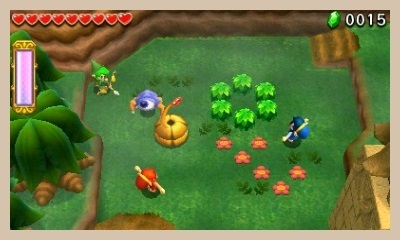 The Legend of Zelda: Tri Force Heroes is a multiplayer game at heart, though like Four Swords and Four Swords Adventures, there is a single player portion to the game as well. However, unlike the two games mentioned, Tri Force Heroes is much more shoehorned into the picture. 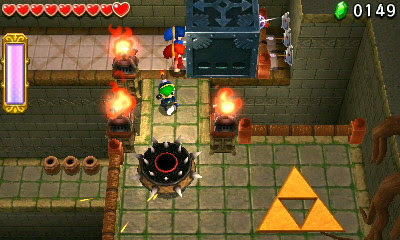 Four Swords and its GameCube sequel saw Links with AI that would smartly follow the player. 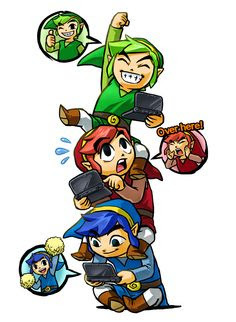 In Tri Force Heroes, while there are but three Links to control, you can only control and move one at a time. This means you'll be using the touch screen to switch between all three, leaving one behind in some instances, and having to smartly utilize each Link. Controlling three Links can be a tedious prospect, and it usually is. Unfortunately, on some levels, even with the ability for the non-controlled Links to be impervious to damage, they can still fall into holes or into lava, causing a loss of a heart. 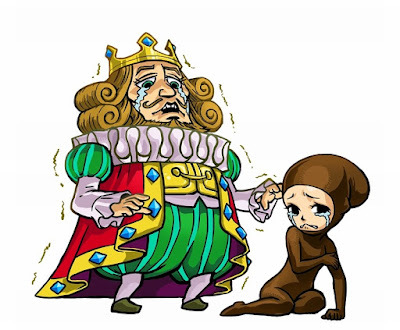 In one instance involving balance beams late in the game, having to switch between Links and control them is equal to trying to rub your stomach and pat your head at the same time. This is especially noticeable when having to do anything that involves the totem ability, where the Links pick one another up, sitting on each others' shoulders to form a human totem. Having to move the Link on the bottom of the totem in a more intense sequence of the game, switch to the Link at the top to use an item, for instance, and do this without taking damage is nigh impossible. It's not challenging for the right reasons. It just makes for a frustrating experience, and one where going solo sometimes is not a benefit to the player. The Fire Gloves even make the Super Mario Bros.
fireball sound effect when used. Thus, multiplayer is available for both local and online play. Sadly, you can't play locally with just two players. You need a third no matter what, whether each player has their own copy of the game or not for download play. Online is the meat and potatoes of The Legend of Zelda: Tri Force Heroes experience, and it is a generally enjoyable experience depending on who you get paired up with. However, you'll find that a game that features an abundance of puzzles without proper voice chat is an effort in frustration, especially if you're playing with randoms. they handle the wrath of a trio of Links? You get eight icons on the touch screen to utilize for "communication" between players. There are icons for telling a player to use an item, to tell other players to form a totem, one to throw a player, and so forth. 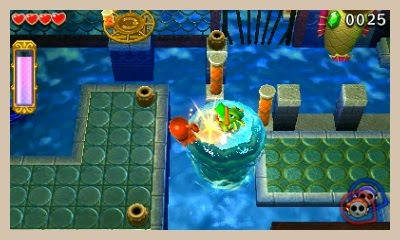 While these are helpful in most occasions, when the puzzles in Tri Force Heroes become more complicated, they quickly lose their usefulness. A boss fight went on much longer than it had any right to have because the lines of communication were so basic and the fight was a bit more complex. Instead of being able to just say, "Let's form a totem with the Boomerang player at the top who will then throw his item into the boss's eye", it was an awkward battle of spamming the totem and item icons, hoping that we as a team would finally being able to combine our otherwise futile efforts and defeat the boss. Reach new heights with the addition of the totem ability. There are eight total areas in the Drablands, and each houses a different locale and hazards. You start off with just one area unlocked, but after finishing it, you open up three more. From there, another world opens up, soon revealing the entire eight areas of the Drablands. 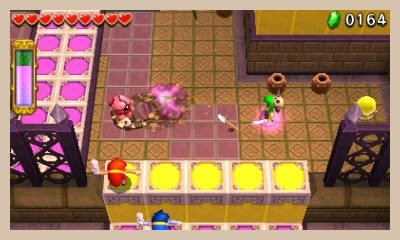 Each of the eight areas in Tri Force Heroes possesses four levels of four rooms each. It takes the efforts of teamwork to make it past each room. 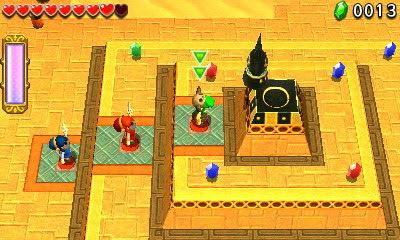 Each level also contains three items for each Link to acquire. Things like the Boomerang, the Bow, the Gripshot, the Gust Jar, and many more. After the Guardian of an area has been beaten, always in the fourth level of an area, you can boost your play time and earn rarer materials through completing one of three challenges in each level. 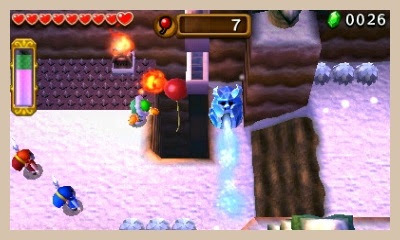 These challenges range from completing a level with fewer hearts, beating a level without a sword, and popping all of the balloons within a level. Every level you clear, you get a choice of opening one of three treasure chests for a material. 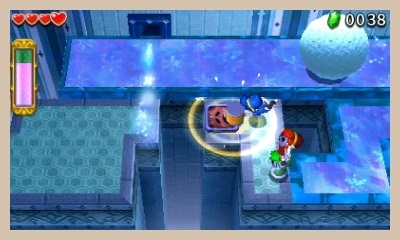 One of the three chests holds a rare material while the other two hold standard materials. As said earlier in the review, all of these materials are used to create new outfits. It is important to mention that the levels in Tri Force Heroes are unevenly designed. Difficulty spikes can occur quite often, making a seemingly enjoyable and easy run through a level end in tragedy and wasted time for all players when you burn through your supply of hearts and faeries (which serve as lives for your team) in one room. Furthermore, I cannot begin to illustrate how many times players have disconnected on me during play. Sometimes it's because it's too frustrating for them, or there's too much lag, a problem that isn't much of an issue for the most part. Other times it's while playing challenges, and when the roulette doesn't give them the selection they want, they wuss out and disconnect. Additionally, if you have a team of randoms that is really working well together, the fun doesn't last, as for each area of the Drablands you want to play, you have to back out, disconnect, and choose the area you want to play. Incredibly irritating. at least in this game's case. 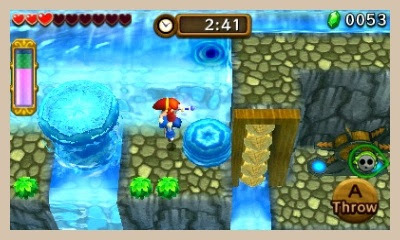 When regarding the presentation, The Legend of Zelda: Tri Force Heroes borrows a lot of assets from A Link Between Worlds, also available on the Nintendo 3DS. The visuals hold up well and it's particularly lovely to see the game in full 3D with level geometry standing out. The music is a marvelous mixture of real life instruments and synth, complementing each other wonderfully to create a surplus of melodic magic. There is no "I" in team, but there is in "Link". Although nowhere near the level of magnificence that The Legend of Zelda series routinely reaches, Tri Force Heroes does get bonus points for innovating on the formula, trying something different, and making for a mostly satisfying multiplayer experience. If the single player wasn't so unremarkable, the communication options weren't so disappointing, and the online was tweaked a little bit in how players link up to one another, The Legend of Zelda: Tri Force Heroes would be an easy recommendation. As the game stands, this multiplayer Legend of Zelda game is just above average, a disappointing phrase to type for a series with such a heralded and honored history.